THE PETALUMA GAP AVA WAS APPROVED BY THE TTB ON DECEMBER 7, 2017! In February 2015, the PGWA submitted a petition to the Alcohol and Tobacco Tax and Trade Bureau (TTB) to establish the Petaluma Gap as a formally recognized American Viticultural Area (AVA). Preparation of the AVA petition was a complex process that involved extensive technical analysis and legal support. A press release regarding submittal of the petition is available HERE. 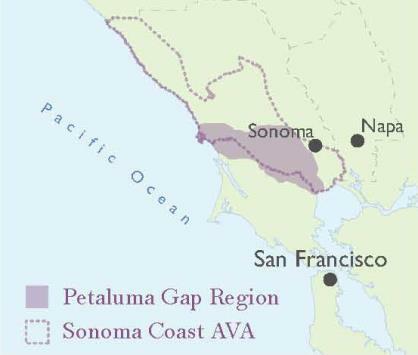 A PDF map showing the proposed boundaries of the Petaluma Gap AVA is available for download HERE. Considerable financial support was required to prepare the AVA petition and navigate the TTB review process. We wish to recognize and thank the following generous contributors for helping to advance our successful efforts to become an official AVA! Discover our passion for making gorgeous wines from our family’s vineyards. Wine is a journey, and we hope you’ll join us as we celebrate 25 years of caring for our property, growing exceptional grapes, and setting the foundation for the most iconic region of the Sonoma Coast: the Petaluma Gap. Open Friday-Sunday from 11:00 am to 4:00 pm. Appointments welcome every day 10:00 am-4:00 pm. Join us for an unforgettable experience. Being a family-owned business gives us the ability to make decisions focused on the long-term, rather than on quarterly stock market results. Managing our business from the vineyards to shipping our bottled wines, enables us to integrate sustainable practices into every stage of the art and science of winemaking. Our estate vineyards include 10,545 acres throughout the cool California coastal regions, where our vineyards sit atop mountains, ridges, hillsides and benchlands. From these breathtakingly beautiful sites, our winemakers draw a rich palette of aromas and flavors to handcraft wines of exceptional depth and complexity. The only way to farm for a diversity of flavors is to farm on a diversity of sites. This, more than anything, is what distinguishes Sangiacomo Family Vineyards. With over 100 unique sites spread over 14 vineyards in four AVAs, we are able to tease an extraordinary range of flavors out of Chardonnay and Pinot Noir. We practice precision viticulture — pruning and irrigation and canopy management in close partnership with our clients to maximize quality and minimize environmental impact. We’ve been farming these lands for three generations. We have enough harvests under our collective belt to know what works where and what doesn’t. Nowhere is this more important than in helping our clients choose the best sites for their wines. Our diversity of sites plus our hands-on approach is what allows us to deliver the nuance that our 50-plus winery clients have come to depend on.